Seven of the eight FTD’s that came after day 10 were successful according the study. While the sample size may be too small to claim significance, there certainly seems to be no credence to the claim that FTD’s after Day 10 are LESS reliable. In fact, the opposite appears true. Seven out of eight seems especially impressive considering the fact that only 55% of the FTD's in the study were successful. I suspect one reason for this may be that the delayed FTD allows stocks more time to carve out proper basing formations before the market attempts to launch higher. In light of the facts, it seems a curious claim for IBD to make. 1) I mistyped in my post. Options were not used in my testing - futures were. 2) My "system" looked at several measures of overbought/oversold - it generally entered if more than one triggered and exited when the triggers were removed. The 15% VIX stretch was one example. The profit potential of a triangle breakout is normally determined by subtracting the low of the triangle from the high and adding that to the breakout point. Triangles are one of those formations that are easier to spot on a chart than they are to program, but I attempted it two different ways. I first looked at formations where the most recent swing low was higher than the previous swing low and the most recent swing high was lower than the previous swing high. A breakout was defined as a move outside the nearest swing high or low. The profit target was defined as the distance from the entry point plus (or minus for shorts) the highest swing high minus the lowest swing low. A “failure” was defined as a reversal through the opposite swing point in the triangle. The second way I defined a triangle was a bit simpler. I looked at weekly bars and defined any two consecutive “inside bars” as a triangle. Here again I set a profit target using the biggest bar and defined a stop point as a move through the opposite end of the most recent inside bar. In both cases the success rates were highly disappointing. Looking at all S&P 100 stocks over the last 15 years, method 1 posted a success rate of about 38% and method 2 a success rate of 30%. The success rate in the S&P 500 Index over the last 30 years was 30% for method 1 and 27% for method 2. Some traders may still be tempted to play the breakout because the potential reward is higher than the risk. Even so, method 1 was only slightly profitable as gains outsized losses by a mere 1.03 to 1 without factoring in commissions or slippage. Method 2 showed net losses. It seems to me that the best way to trade these kind of triangle formations is not to play the breakout. Since about 2/3 of the breakouts I tested eventually failed, I’d rather wait for the breakout to occur and then evaluate possible reversal areas that could offer a more substantial edge. As an example let’s look at the NDX. If you require a gap of at least 0.25% each day and a reversal of at least 1% from the opening price, the NDX has closed lower between 57.5% - 61% of the time over the next 1-3 days. Losses generally outsized gains as well. The pattern has occurred 41 times since 1986. The next day the market lost 0.8% on average. It lost 0.9% on average over the next 2 days. Even more compelling is the average gains realized over the period. For the 1-day following the occurrence, the market gained on average 0.4%. An average day in the NDX since 1986 saw a gain of 0.06% - much lower. An average week for the NDX was about a 0.3% gain. The average week after the failed gap up? A 1.3% gain. I'm pleased to announce the Quantifiable Edges Subscriber Letter is now available. Those who signed up to recieve the first week's issues free of charge should have already have them in their mailbox. I decided to make the first issue available to anyone. Just click here. Trial subscribers will also be receiving a primer on "How To Get The Most Out Of The Quantifiable Edges Subscriber Letter". Should you wish to receive the primer and the rest of this week's issues for free, just drop an email to QuantEdges@HannaCapital.com with your name and email address. Any questions or comments about the Subscriber Letter may also be sent there. Follow Through Days - Better After Small Or Large Declines? As someone pointed out in the comments section today, Investors Business Daily finally declared a Follow Through Day (FTD) on Wednesday. Therefore, I thought I should post the next study in my series on Follow Through Days. When we first started I had planned on this being Part 4, but the study has evolved as the market moved in interesting ways. For those who missed the first several parts of the series, you may click here for the full shebang. This will be the 8th post on the subject. When I am finished I hope to have the most complete and accurate information available anywhere on Follow Through Days. Today I will try and assert whether Follow Through Days are more reliable after small or large declines. As you may recall, in the standard test I set up initially, I chose a decline of 8% to be required before a FTD would be looked for. To my knowledge, how deep or long a decline must be before someone can begin looking for a FTD has never clearly been defined. In September of 2005 IBD suggested that FTD’s can be useful even after pullbacks as small as 5%. I decided to look at how FTD’s performed after pullbacks of varying degrees of market declines. Below are the results from December of 1971 through today. Success parameters are laid out exactly as they were in Part 1. After a decline of 5% or more – 115 FTD’s, 63.5% successful. After a decline of 10% or more – 48 FTD’s, 48% successful. After a decline of 12% or more – 36 FTD’s, 44.4% successful. Generally, the deeper the decline, the less likely it is that a FTD is going to be successful. It is reasonable that more serious selloffs have more difficulty reversing. It is a bit disappointing though that a tool which is billed to signal the end of a market decline seems to fair worse when it’s needed most. ** This was the base test looked at previously. Would you like detailed market analysis, CBI sector coverage and quantified actionable trade ideas from me several times per week? The Quantifiable Edges Subscriber Letter is coming next week! Just send your name and email address to QuantEdges@HannaCapital.com to receive the first week’s issues free of charge. More details should be available this weekend. Today saw some big swings but did little to change my moderately bullish bias. Rather than post a study tonight, I thought I’d change things up a bit. In some comments on January 23rd, “Tim” mentioned he remembered an article I’d written a long time ago in which I discussed “double support stops”. (It was actually the first column I ever published). Since then I’ve seen a large number of readers have done searches on “Double Support Stop Rob Hanna” or something along those lines. Anyway, the column can’t be found anywhere anymore. But you want it – you got it. From way back in 2002 (along with a 2002 chart and ticker symbol - the ticker has since changed to HW if you want to pull it on your own software), I give you “The Double Support Trailing Stop”. Like most traders, I have a whole checklist of criteria that must be met before I will consider purchasing a stock. I spend a substantial amount of time researching potential candidates so that I may find a few stocks that meet my criteria. One of the most frustrating and difficult things for me is finding a great stock, buying it at the right time, and then being stopped out of it just before it reverses and goes on to huge gains. Having traded in multiple time frames over the years I have experienced this frustration with day, swing, and intermediate term trades. To keep myself in winning trades longer and avoid being shaken out early, I developed my “Double Support Trailing Stop Technique”. I will show an example of this technique on an intermediate term trade, but have successfully employed it in many different time frames, and originally created it for my day trades. The idea is simple. If I require a large numbers of reasons to enter a trade, I should require more than just one reason to exit it if I want to catch as much of the move as possible. I will therefore require two levels of support to be broken before I will PERMANENTLY & COMPLETELY exit a trade. How you define support does not really matter. You can use pullbacks, consolidation lows (or highs), fibonacci’s, moving averages, trend lines, or whatever fits your trading style. Next, the stock moved up again for several days before making a second pullback down to the green arrow labeled “Broken Support”. The “Broken Support” bar was initially just the next area of support after the stock had pulled back and moved higher. When that happened, I was able to move my stop up under the 1st green support arrow. It became “broken” 5 days later when the next bar labeled “Support” moved below the low of “Broken Support”. If I had exited at the “broken support” level here, I would have been shaken out of the stock and missed the rest of the move. Instead, the stock continued to move up and create higher and higher support levels. The time came for me to sell this stock at the area marked “Double Support (Sold When Broken)”. It was at this time that the stock moved below two levels of support. 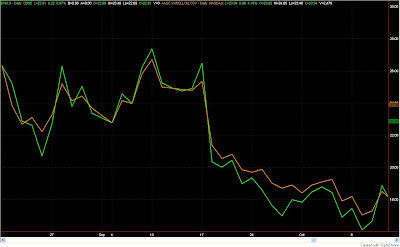 The first was the 50 Day Moving Average, and the second was the pullback low just above the “Double Support” green arrow. As you can see, this turned out to be a good time to take profits and exit this trade. Three days later it was trading nearly 30% lower. Earlier I used the term “permanently & completely exit”. Due to the fact that the 1st and 2nd levels of support may be very far away from each other in some instances, I may consider exiting the position partially, or exiting and then looking for an opportunity to re-enter the position, when it breaks the 1st level of support. The main reason I would do this is not to give back too much of my profits. Once two levels of support are broken, I want to be completely out of the position and will not consider re-entering without a whole new base setting up. Since the “Double Support Trailing Stop” will keep you in positions longer, it is most effective when you are trading with the overall trend of the market. In other words, long positions in an uptrending market, and short positions in a downtrending market. After the negative inside day on Friday, the S&P refused to sell off hard and even posted a decent gain today – breaking its recent streak. Perhaps this may signal a change in character from the downtrend since the October highs. Traders may not be looking to leave the party every time there’s a pause in the conversation. Speaking of pauses, have you noticed how the price range has been tightening? The range over the last 3 days has been the tightest of any three days since December. Even more interesting to me is that over the last 13 days, the high-low range the S&P 500 has traveled has barely exceeded the range it traveled in the one day prior to that. The SPY on January 23rd had a range of $7.35. Since then the total range has been $7.88. Looking at the S&P 500 cash index I went back to see other times the market traded in a range nearly as tight relative to one bar over a 13-day span. The parameter I used was that the range of the last 13 days had to be within 115% of the range of the 14th day back. I found 31 other occurrences going back 30 years. Twenty-five of those occurrences saw the market higher a month later. Only three times that I found was the range contraction followed by a break to the downside which led to significantly more selling. Those occurrences were August 1985, September 1990 and August 1998. This study seems to be another example of what I’ve been seeing lately. Over the next several weeks risk/reward appears to favor the upside. Even this contracted range has some serious volatility, though, so risk should not be underestimated. Good timing and proper (reduced) position sizing appear key. On another note, I was pleased to have my recent post on leadership breadth appear in this week’s Festival of Stocks along with many interesting columns from other bloggers. Friday was an inside day. For me that meant laying in bed most of the day trying not to vomit. For the market that meant a lower high and a higher low than Thursday causing Friday’s range to be completely “inside” Thursday's range. The indices also closed lower on the day. Below is a chart of the SPY going back to October 8th, which was the day it closed at its highest level. Every inside day with a down close is marked with a blue dot. After all this recent testing of "conventional market wisdom" I’m starting to feel like Adam and Jamie from the Discovery Channel. Myth: Leadership Breadth Is Important At Market Bottoms – BUSTED! Think I could land my own tv show? The market gapped lower as I was hoping and then after much back and forth it finished on an up note. As I indicated last night, I was interested in buying a large gap down and have held on to some of the position for a swing trade. This one has worked out so far, but I’m not terribly excited with today’s action. Over the last few days there have been some fairly extreme readings. Two examples were the Arms Index mentioned two nights ago and the sharp three day selloff followed by a sizable gap down this morning. The reversals generated from these conditions the last two days have not been inspiring. Today’s action was wildly up and down. Bulls have not been able to take control for more than a couple of hours at a time. It has now been 5 days since the January 31st follow through day. Last Friday I did a study on the short-term implications of follow through days. It showed that success or failure of the new bully rally attempt is about 67% predictable based on the action of the first 5 days after the follow through day. That study therefore now predicts a continuation of the bear. The good news is the market has managed to hold support so far. Readings around the January lows were severe enough that it remains plausible a significant bottom could have been made. I’ve obviously not yet given up on that idea. The market is in no-man’s land right now. Tests run tonight based on current action are showing no significant edge. Technically, a move above 1400 would signal the bulls are taking charge while a move below 1270 would signify the bears are still in control. That range is very wide but with the recent and expected volatility, I’d be surprised if it wasn’t broken fairly soon. I’m holding a small long position leftover from today but not looking to aggressively add to it. The study I posted last night showed a good possibility of a one-day rally in the S&P. The one day rally lasted only half a day. After that the market fell apart again. I’ve gone over a few things tonight, but I’m seeing pretty much what I expected. Price is becoming stretched, but the price drop alone isn’t providing any huge edge. 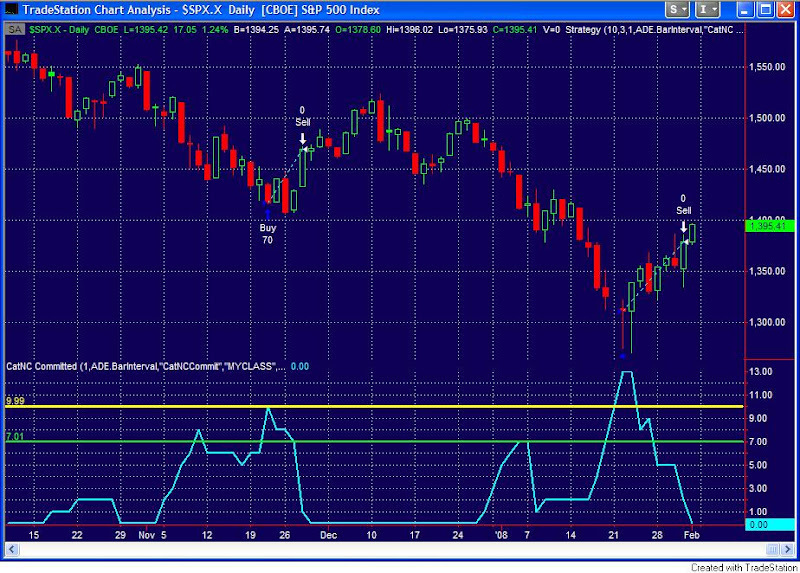 An example would be the current Nasdaq price action. The Nasdaq has dropped over 1.25% three days in a row. Looking back to 1985 this has happened 48 other times. Over the next 1-2 days the Nasdaq has rebounded about 2/3 of the time. Not a bad ratio, but the average losing trade dropped about 4%. That’s more downside risk than I’d like to take on. Many of the oscillators and other market gauges I follow are simply not stretched the way they were two weeks ago. My Capitulative Breadth Indicator (CBI) -click CBI label for details- for instance still remains at 0. Once we get closer to retest area a case could be made for an entry on some kind of reversal since a reasonable stop should be nearby. We aren’t there yet and I’m not comfortable looking for even a swing trade at this point. One thing that may interest me is a gap down tomorrow morning. Cisco (CSCO) is trying to help create that. I showed recently that large gaps down in downtrending markets offer significantly more reward than large gaps down in uptrending markets. A gap lower therefore could be playable. I would only consider keeping part of the position beyond a day if it was strongly in my favor. There was some serious selling pressure today. Selling swamped buying on both the NYSE and the NASDAQ. The Dow, S&P 500 and Nasdaq all finished down close to 3%. Volume rose across the board. The Arms Index for both the NYSE and the NASDAQ was very big. (Although as you can plainly see from the picture on the right, my arms are bigger.) The NASDAQ Arms Index closed over 3 and the NYSE Arms Index closed at about 2.7. Many people view large spikes in the Arms Index as a contrary indicator. It reflects panic selling on the part of market participants. This panic is viewed as a short-term oversold condition that leads to a reflexive bounce. I ran some tests to measure today’s action against history. All tests were run back to 1/1/92. I found that a 1-day spike in the Arms Index of either the NYSE or Nasdaq without confirmation from the other showed very little edge. A Nasdaq Arms Index greater than 3 has occurred 79 times since 1992. The next day the Nasdaq finished higher 57% of the time. The average winning trade was 1.7% but the average losing trade was 1.9%. The total expected value was a scant 0.2% rise the next day in the Nasdaq. The NYSE Arms Index has posted readings over 2.5 fifty-seven times. The next day the S&P 500 rose 63% of the time. The average winning trade was 1.2% and the average loser 0.8%. On average the S&P gained just over 0.4% the following day. Neither of these stats really gets me juiced about jumping in front of this train. (Did you see the photo of me looking juiced?) When I look at the events on a combined basis, though, results improve dramatically. Since 1992, there have been 13 days where the Nasdaq Arms finished over 3 and the NYSE Arms finished over 2.5. The S&P 500 rose 11 of the 13 times the following day. The average gain in the S&P 500 was 1.6% and the average loss was 0.15%. The average trade the next day was good for 1.3% and the mean was 1.2%. After one or two days the results fell more in line with random. Any edge here appears to be very short-term. Looking out a bit longer, the recent bottom is now looking very much in question. The positive feelings the bounce brought about were nearly all washed away yesterday and today. As I’ve been pointing out, the action immediately after a Follow Through Day is normally telling. So far it doesn’t look good. Lastly – some house cleaning. Tradestation apparently did a data update on their advance/decline data last night. The Appel Daily Breadth signal I’d mentioned a few nights ago is now no longer appearing. As you might imagine, this aggravates me to no end. I doubled checked using other databases and found a signal should not have been generated. (It came very close.) I’ve imported advance/decline and volume data from one of my other data sources and will be using that from now on. Tonight’s tests were run using QP3 data imported to Tradestation (and confirmed with a 3rd database). I apologize for the false information generated by bad data and have already taken steps to minimize the chance of it happening again. “Given the market's volatility since late December, you'd need to see bigger gains than Thursday's to signal a fundamental shift in the market's trend. From my perspective, Thursday satisfied the requirements IBD previously laid out for Follow Through Days. Due to their perception of volatility and breadth they remain negative on the market's prospects. As they should, they are deriving their outlook from multiple readings of market health. Unfortunately it seems they would like to advertise the Follow Through Day as a magic indicator that never fails. Therefore, either they make excuses or change the definition of it so that it appears not to fail. Should this rally take hold I have no doubt they will refer to last Thursday as a Follow Through Day in a future publication. It is a tool that uses volume and price action. Breadth, while important, is a separate matter. Once again the Lowest RS stocks trounced the Highest RS stocks by more than the Dow itself bounced. In fact 4 of the top 6 performing Dow stocks during the bounce were among the 5 “Lowest RS” stocks I listed. For those that haven’t been paying close attention, the CBI closed at 2 on Thursday and 0 on Friday. While I suggested taking at least partial profits earlier, Thursday’s move below 4 would have signaled the exit to the standard CBI trade I’ve discussed in the past. Below is a graph showing the action in the CBI going back to October. Buying the close on the 22nd and holding until Thursday’s close would have been worth about 5% in the S&P 500. Of course with some stock selection such as described in the Dow example above, traders may have done significantly better. Incidentally, a zero CBI is not a signal to short. The CBI only measures "oversold" - not "overbought". **9:55 am - Edit - I've now been told my data is in conflict with others who show 1/31 to be about 82% upside volume. Investors Business Daily in their Big Picture column on Friday noted that “There are virtually no stocks close to proper buying positions right now.” This is a measure of breadth and potential leadership. The basic idea is that the market will struggle to rally strongly without leadership. A few weeks ago it was pointed out to me that from July 2007 until now there has been a higher concentration of 90% volume days on the NYSE than at any time since the 1940’s. (A “90% volume day” is a day where either up volume or down volume swamps the other by at least 9 to 1.) Lowry’s created the 90% day concept and has used them to identify market bottoms in the past. Detailed information can be found in their recently updated 2001 study. So far while this market rally has produced some strong up days with both price and volume it has yet to produce a 90% upside volume day. This would seem especially concerning to me given the fact that they have become more frequent recently. Brett Steenbarger has also done some great work with the concept of breadth volume. He refers to it as “herding”. Here is an introductory discussion of it from his blog. For more discussion you could simply search on “herding” in his search box on the top left hand corner of his page. I'm curious to see if Dr. Steenbarger has anything to say about this in the near future. In Gerald Appel's book "Technical Analysis - Power Tools for Active Investors" he publishes a system called the "Daily Breadth Impulse Signal" (chapter 6, page 142). Essentially it looks to enter the market when the 10-day exponential average of advancers/decliners hits an extreme. The trade closes when the same measure eventually declines to a certain number. The published results were fairly impressive. Since 1970, there were 26 trades with 22 winners and four losers. Avg winner: 5.24%. Avg loser: 2.37%.I recreated his indicator some time ago. Using my data, results were slightly different, but similar.The last signal given before publication was 05/2004. According to my data, in November of 2004 another signal triggered. This one lasted for close to a month and was good for about a 1.3% gain. March 21, 2007 was the next trigger I could find. Unfortunately, the signal was cancelled 5 days later on a shakeout, causing a whipsaw loss for the system as it was unable to benefit from the uptrend that followed. 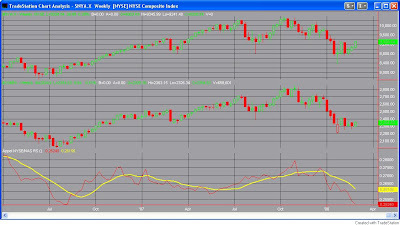 According to my data, Friday 2/1/2008 gave the first buy signal since 3/21/07. The entire paper may be found here. The quote was taken from pages 24 and 25. Breadth has been extremely strong, but we’ve yet to see a real rush that would look like a “herding” day. The strongest areas in the last week and a half have been those that were beaten down the hardest. Contrary to what some would have you believe, this is NOT unusual at market bottoms. (I’ll review results from my previous post on this later.) I’m continuing to take it day by day. Since exiting my long positions based off my bottom indicators I’ve yet to reallocate heavily either long or short and am waiting for a better edge. Part 1 - Are They Predictive? Part 2 - Does Every Rally Have One? Part 3 - Do They Miss Too Much Of The Move? While intermediate-term traders are rejoicing with today’s Follow Through Day, swing traders are noting how overbought the market has become on a short-term basis. Most of what I’ve read by short-term traders this afternoon and evening has been short-oriented. The prevailing theme is that we are now short-term overbought in a longer-term downtrend (or bear for some). Most people believe these are ideal conditions for shorting. What swing traders looking to short need to understand is that nearly every Follow Through Day produces short-term overbought conditions in a downtrending market. They frequently arrive within 4-7 days of a bottom. Today was day 7 of the rally. As it was last week, most of the time the reversal off that bottom is violent. This can cause oscillators to become overbought. When the formula calls for a typically violent reversal, a week of gains, and a strong rally on high volume to cap it off – you’re bound to be overbought short-term. Does that mean it’s a good time to try a swing trade short? More often than not the market trades higher over the next 1-5 days. The average win is larger than the average loss. Profits continue to be made on the long-side. Shorting is a losing game in this scenario. Perhaps this disbelief by short-term traders is what helps to continue to fuel the rally as they are constantly forced to cover their losing positions. Is short-term success or failure indicative of long-term success or failure? One interesting claim that IBD sometimes makes about Follow Through Days is that those that fail normally do so shortly after the Follow Through Day. I decided to also look at this concept tonight. I broke the 64 Follow Through Days in my study up into two groups – the successful ones and the unsuccessful ones – to see if their early performance hinted at their chance of longer-term success. Below are the breakdowns – same as above - $100,000/trade, long at the close of the Follow Through Day, and exit X days later. Right off the bat most of these posted nice gains. The short-term winners among the group averaged another 2-3% upside in the first week. The short-term losers suffered 1-1.5% drops on average. Net profits were substantial. Those that eventually failed tended to show signs of failure right away. Notable here is the average loss was appreciably higher than the average gain. A basic rule of thumb is that the success or failure was determined with about 67% reliability within the first week after a Follow Through Day. For instance, note there were 41 total trades that were in the black after 5 days. About 2/3 of them went on to “successful” rallies. The same ratio applies for the losers. There were 23 losers after 5 days. 15 of them ended up with “failed” rallies and the other 8 were “successful”. The 2/3 rule holds fairly accurate whether you are looking at winners or losers over any period from 1-5 days after the Follow Through Day. The Unemployment Report tomorrow morning has a chance to set the tone early on in this one. 1) Don’t be too eager to short. It’s doesn’t have positive expected value just after a Follow Through Day. 2) Watch market action closely over the next week. It should give you a pretty good indication of the intermediate-term.